The generation that invented popular culture is ageing, with the percentage of the population aged 65 or over increasing from 8% to 13% in OECD countries by 2035. This is having a seismic impact on aesthetic, social and vitality-related economies. Seniors are typically wealthier than the broader population. Two in five seniors say they have money to spend on luxuries or save at the end of the month, versus a quarter of the population at large. How are they spending? The beauty industry is one beneficiary of the nexus of later retirement and wealth. Many seniors are not retiring, with 1.1 million now working beyond the age of 65 because they wish to or need to. Seniors say they feel more professional when they are well groomed — and so brands are now positioning to male and female seniors in categories ranging from aspirational clothing to makeup. 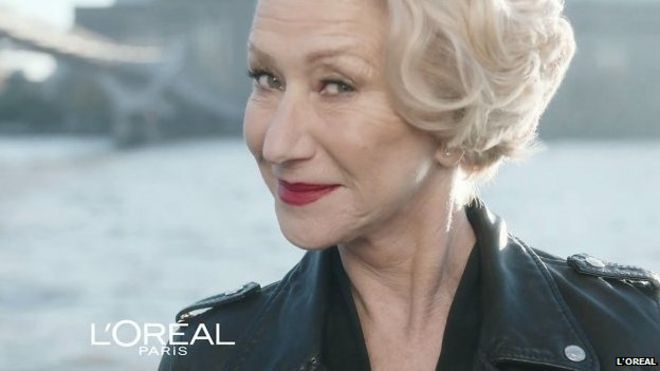 In 2014, Helen Mirren (then aged 69) became the face of L’oréal Paris Age Perfect Skincare. The social industry. Seniors are dating more. Rather than ‘toughing it out’ in unfulfilling relationships, increasing numbers are divorcing. French couples married for 35 to 40 years are now as likely to divorce as couples married for five years. From dating to gyms, from food to clothing, multiple sectors are experiencing increasing activity fuelled by an ageing and engaging population. The delivery industry. The percentage of the population aged 80 or above will more than double to 10% by 2050. Delivery is key for elderly citizens with limited mobility. From groceries to medication, the convenience trend appreciated by millennials is also valued by the elderly — just for different reasons. Voice-activated purchasing — think Amazon Echo and beyond — will be a key capability. Financially, women are discriminated against at both ends of the fiscal funnel: four decades after the Equal Pay Act in the UK, the hourly wage gap for women is still 18% according to the Institute for Fiscal Studies; and women are charged more for buying the same products. Mintel data suggest women spend £1,000 per year more than men just through unequal pricing; women’s jeans, for example, typically cost more than men’s. With equality in focus, consumers are likely to seek brands that pay men and women equally and price goods equivalently — and shape brands’ behaviours by doing so. More broadly, sexism is being challenged through the introduction of new products (Lammily is a doll, like Barbie, but with realistic body proportions) and the satire of sexist ones. Gender-neutral shopping is on the rise — most strongly around children’s goods ranging from story books and toys through to children’s care products. The trend is driven by younger parents; according to Mintel, one in seven say that when shopping, they value most an absence of gender stereotyping and the presence of aspirational role models. In the UK, Ladybird has announced it will no longer brand books as ‘for girls’ or ‘for boys’, while Sam Farmer has created a range of unisex beauty and personal care products for young people. Non-compliant brands are increasingly being lobbied or boycotted until they change. Men are becoming increasingly image-conscious. In 2015, for the first time in history there was more interest in men’s hair products than women’s on Google. Levi’s has recognised that men want customised jeans just as much as women do. Interest in technology among many men provides a powerful engagement tool. Men want more of the capabilities from which women have traditionally benefited, including smart mirrors and e-sizing, and are being offered products including devices to analyse their skin. While men are becoming more style-conscious, trends around machismo and masculinity are slowly weakening. Increasingly, men are happy to buy products without ‘male’ branding. Consumer expectations regarding convenience and delivery are increasing rapidly. An independent survey of global retailers in September 2015 highlighted that convenience is now the number one influencer on retail development. Ranked seventh most important in the same survey just two years ago, overall shopping convenience is now the top driver of retail planning. Price competition — ranked second most important in the survey two years ago — has slipped to fourth. While the offline world influences our online experience (metaphors employed for the presentation of software functions usually mirror the off-line processes to which they relate) the same is true in reverse. In a world in which 20% of internet users abandon an online video if it takes more than five seconds to load, we expect the real world to work as seamlessly as our online experiences. There were 34 billion visits to US stores in 2010. By 2013, that number had plummeted 48% to 17.6 billion, according to Elite Wealth Management. As consumers make more of their purchases online, the challenge of engaging consumers in store is accelerating the rise of ‘experiential shopping’. In the UK, Lush is promoting its new perfumes with a range of free, in-store scented film screenings. Department store Brown Thomas plans to open an in-store pub. Deliveroo installed a giant slot machine in Waterloo Station that dispenses samples from top restaurants to commuters who pull a lever. In China, a shopping mall features a dragon-shaped slide carrying shoppers from the fifth floor to the first, while Ikea encourages shoppers to have a nap on their beds. In France, in recent months Ikea has created an adult-size ball pool, and an outdoor climbing wall using the brand’s products, to celebrate the opening of its latest stores. Early stage companies are responding to, and catalysing, these opportunities; AppearHere, a high growth company in our portfolio, makes it easy for retailers to discover and unlock exclusive spaces they can use on a temporary basis for imaginative engagement and commerce. Given its potential for engagement, the use of technology often features heavily in retail engagement initiatives. Virtual reality (VR) and Augmented Reality (AR) are ideal opportunities for retailers. While expensive for consumers to buy for their homes, brands can pay and deploy them to draw people in store. The beauty industry is likely to be an early adopter, with virtual mirrors enabling consumers to explore how products will look. Beacons are in-store devices powered by Bluetooth Low Energy (BLE) that transmit data to other BLE-enabled devices such as smartphones. Detecting devices based on their location and prior behaviour, beacons can send to shoppers data ranging from personalised messages and offers through to indoor navigation and check-in. Trials of beacons, and interest in their potential, have increased in recent years. In the UK, 17% of retailers have implemented beacon systems in store, and 24% of them saw increased sales as a result. In the US, in 2015 following a trial period, Macy’s began the largest beacon rollout to date with over 4,000 devices planned for their flagship store to drive engagement. The potential for beacons has increased as consumers are increasingly comfortable to trade privacy for value. Mintel’s research shows that one in three UK consumers aged 16 to 34 agree with the statement “I would be willing to give brands that I like access to my real-time location to receive more relevant offers”. Beacons have their challenges, including (typically) the requirement to download a specific app, so traction remains uncertain. As with QR codes, a key question is whether technology will supersede beacons before they hit critical mass. Carrefour has invested in a different approach to beacons, using Philips LED lighting systems to transmit promotional codes to smartphones via light waves. The LED approach is, however, expensive. While beacons are relatively cheap, the LED approach requires a store’s lighting system to be replaced. My thanks to Mintel Trends (http://www.mintel.com/mintel-trends) - a great trend analysis service that monitors, tracks and interprets consumer behaviour. A collection of stories and experiences from the early-stage technology and venture capital communities. Curated by MMC Ventures.